From its title (meaning "in the blink of an eye") onwards, Greta Alfaro’s In Ictu Oculi is concerned with the viewer’s experience of time: the eye is yours. The work’s title, which alludes to the brevity of human existence, is shared with a number of vanitas paintings from the seventeenth century, and, like them, Alfaro’s video treats the stuff that surrounds us as coded references to our own demise. 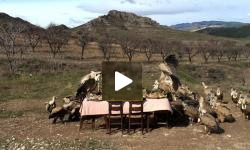 A dinner table, laden with plates of food and wine bottles, its chairs waiting to be occupied, stands in a scrubby, semi-mountainous landscape, a breeze flickering its tablecloth. The table’s placement, in the centre of the frame (the shot is still), makes unmistakeable allusion to painted conventions – the Last Supper, the Supper at Emmaus. And yet the occupants, when they arrive, transform the table’s Biblical and epicurean suggestions into something nightmarish and deathly. The stilled moment of the painted meal becomes subject to cinematic time: movement is change. Vultures descend, from nowhere, their bulk and scrabble bringing instability to the implied order of the scene. Yet the meal’s duration, and its strange quietness (aside from the flapping of wings and chink of claw on plate) lend it a human quality: this might be the soundtrack to a medieval banquet. The birds here, like Hitchcock’s, act out repressed human desires (to gorge oneself): they’re us, with the mask off. In Spain, major social get-togethers (such as weddings or holiday family meals, for example) can start shortly after noon and carry on way after dusk. In this long intermezzo, the table is refilled with an incessant succession of hors d'oeuvres, seafood, roasted lamb, pork, salads, abundant wine, seasonal sweets, liquor, and cigars. To ease digestion, the meal is often spiced up with juicy gossip and the laundering of family secrets, unsolicited medical updates, bad jokes, ill-intentioned puns and eventually blatant insults that in the worst cases leads to drama (domestic violence indeed spikes during the holiday season). The vibrant atmosphere at such social gatherings, which amateur photography has enabled us to shamelessly share with others, is the favorite subject of Greta Alfaro (born 1977, Pamplona, Spain). It also serves as an inspiration for her newest project at Marta Cervera gallery in Madrid. Included in Photoespana, Spain's most eminent photography festival which this year is articulated around the leitmotif of "the everyday," it marks the artist's successful gallery debut for which she's been awarded a prize by the Spanish publication El Cultural. Unlike her previous series Budapest & Vienna and Celebration, for which Alfaro appropriated and digitally manipulated family photographs from albums bought at flea markets, her most recent works depict no human figures. Far from the kitschy decor of earlier works, the table is now situated outdoors in a desolate winter landscape. In the first photograph, it is heaped with culinary delicacies. The last shows only the unsettling remains of a messy gathering as vegetables, unopened bottles of wine, cutlery, broken dishes, dropped chairs and even dismembered animal legs appear scattered on the floor around the table. A video work, In ictu oculi (In the twinkling of an Eye) reveals the identities of the mysterious guests: a large group of vultures that descended en masse to wolf down the banquet. Unaware of the presence of Alfaro's "hidden" camera, and clearly unaccustomed to such formal salon settings, they fight over the lamb chops and drumsticks, breaking the glassware and knocking over the chairs. Not unlike in Bruce Nauman's nocturnal films of his mice-infested studio, the work offers a fascinating revelation of what occurs in the artist's absence. Sharing Nauman's voyeuristic tendencies, Alfaro alludes to the excesses that the dubious genre of family photography has traditionally failed to capture, if not deliberately concealed. Despite their majestic beauty, vultures have traditionally enjoyed a rather negative reputation. From Freud's psychoanalytic read of Leonardo's The Virgin and Child with Saint Ann, to the more disturbing versions in the works of Klee and Kafka, their appearance in art and literature has often been linked to deviant behavior, maladies and death, possibly due to their unorthodox eating habits. The unrefined attitude displayed in Alfaro's "domestic" footage will probably not change their troublesome image. On the contrary, it continues to provoke a kind of discomfort both familiar and uncanny. While my psychoanalyst hasn't given his opinion on this matter, I couldn't help picturing certain relatives and co-workers sitting at that table. Carlos: Let's talk about the beast. 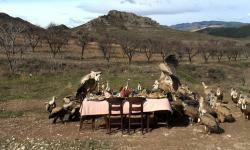 The exhibition has recently opened at the Huarte de Pamplona, entitled Praise the Beast, shows two pieces with strange characters: In ictu oculi, in which a group of vultures is precipitated on an elegant table set up for banquet and In Praise of the Beast, which gives its name to the exhibition and is led by a group of feral predators. What Greta Alfaro sense for the presence of the beast? Greta: In my work I’m usually interested in what we hide in our daily life, part of our identity that we want to show, both individually and collectively, and for the reasons that lead us to it. What scares us about ourselves? Is the certainty of our own finitude? Is the irresponsibility with which we conduct our daily lives at the expense of others less fortunate? "The awareness that we do not fit the model ethical, moral, aesthetic, vital that we offer and we are full of errors? Does violence and terror hidden and always ready to jump? In this case, the beast symbolizes all these fears. On the one hand, the protagonists of both works are wild animals, beasts, traditionally associated with unpleasant aspects of life such as death, disease, dirt or aggression, which operate somewhat like a fable, a metaphor of our own behavior as humans. On the other hand, the Beast is the Devil capital, the traditional opponent of God, of good and order, the representation of evil, dark side of chaos. C. Commend the Beast also be understood as an admonition to the human (rational). To what extent are your works are a settling of scores against a certain "arrogance" of the rational? G. Showdown sounds a bit harsh, but certainly the title is a comment on the arrogance of man and the exaltation of rationality as an excuse to manipulate the world regardless of the nature is always stronger than us. Our culture is obsessed with control and security as protective emblems of the welfare state. Both enjoy or suffer the privileged fragment in space / time we live in, while the world is plunged into chaos never seen before. Hunger, disaster, ecological disaster, war, etc.. which are the result of that lifestyle. C. In both ictu oculi as the Beast In Praise of human creation, made in the form of cuisine, has a very short lifespan. It seems that without the protective presence of ourselves our works can not last, our culture, in all its forms, is subject to our existence and our presence is ultimately perishable. Is it the work of Greta Alfaro self-conscious of their own impermanence? G. I think our own transience - the temporality of our life and work, the aging and deterioration - is one of the great taboos of our culture today. Through my work I reflect on this because I think about it often. One can be sure of his past and direct its course from the present, but ultimately the future is beyond our control from any possibility is now feasible. It is important to me that the work be universal, eschew fads and trends. I believe that the honesty of the artist himself is essential in tackling the artistic work and that such grants, except that it may be appropriate, reduce the understanding and interest of the pieces to the present moment and a geographical location and cultural background concrete. I am interested that the work is kept simple and easy to refer to timeless themes, which are also relevant today because they are inherent to our human condition, and place the work not only in the present, but within a tradition.